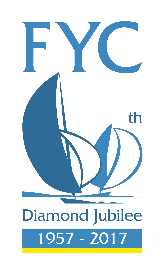 Next weekend is the Fisherrow Yacht Club Regatta, please could you relay our invitation to your members to attend. We would very much welcome visiting yachts and dinghies at our event which is made even more special by this being our Jubilee year; there is a great vibe around the club and we have just opened an exhibition celebrating the history of the club at the Musselburgh Museum in case anyone is passing that way. The event is part of the FYCA Yacht Regatta Series and our fleet of bilge keeled cruisers enjoy some close racing, both experienced and novice race crews should find good competition. The same applies to our dinghy fleet which races under PY Handicap, we will be encouraging our newer sailors to come out and race and we welcome all abilities at our small and friendly regatta. Just please let us know you are coming so we can get the right amount of cake! and the NOR is also on the Qualifying Regattas page.